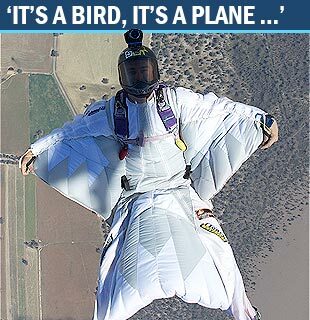 World Wide Wingsuit News: Australian flocking? This Australian news site says local wingsuiter Hayden Galvin will be leading "32 of Australia's best skydivers and base jumpers as they hone their skills in one of the world's most extreme sports." Except they don't mention leading in what... I imagine they mean a flock or a record attempt? Anyone have the scoop on this. Also, apparently we here in Europe train our wingsuits in wind tunnels?